On December 14, 2016, the Conference of Presidents of Major Jewish Organizations (the Presidents Conference) in concert with the Embassy of Azerbaijan held a historic Chanukah party in Washington, D.C. that will be talked about for some time. Controversy continues to swirl over not only who attended the party, but who did not; how many were clicking glasses inside and how many were scowling outside. Ironically, this special event was singularly memorable not only for its historic collection of diplomatic personalities but also for the landmark under-reporting and misreporting of the event. 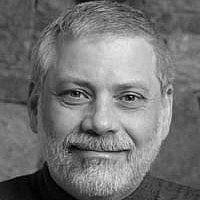 The Presidents Conference is comprised of the presidents of 50-plus so-called “major” Jewish organizations, although some are so small few have heard of them. 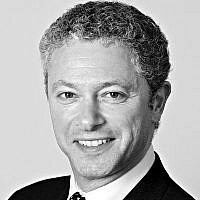 Malcolm Hoenlein serves as executive vice chair of the conference. The Conference Hanukkah party was timed to intersect with the official White House Chanukah party being held a few blocks away the same evening. Included among the approximate 150-200 attendees were at least 13 ambassadors and other senior diplomatic envoys, many from predominantly Muslim countries, along with Israeli Ambassador Ron Dermer. The senior diplomats hailed Turkey, Kazakhstan, the Kyrgyz Republic, and Tajikistan, as well as Belarus, Romania, Russia, Greece, Bulgaria, the Czech Republic and even the PLO Mission, along with the Azerbaijan Embassy sponsors and Israel’s Ambassador. Around Washington, D.C., it is not hard to attract senior personalities and officials to a party. Top congressmen and senators are always special guests and speakers at luncheons, conferences, and receptions. Typically, they dash in and dash out, within moments of their appearance, lingering just long enough to read a short political statement and then exit. The highlight of the event was bestowing formal thanks to all the countries who had contributed fire fighting forces to Israel during the wild blazes that scorched the homes of hundreds and forced thousands to be evacuated throughout the country. 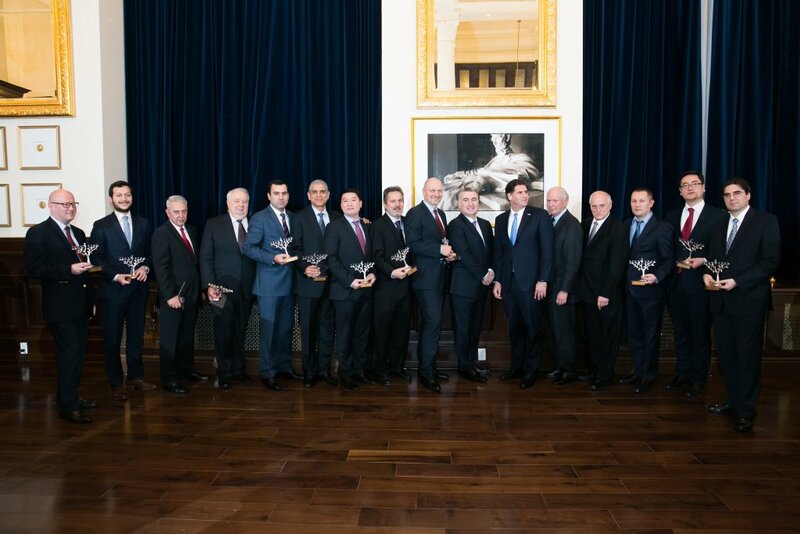 Each ambassador or senior envoy received a mounted menorah as a token of esteem, described as “a reminder of Israel’s national pride.” Ambassador Dermer and Hoenlein used the occasion of the international fire fighter assistance to proclaim that Israel was not as isolated as many pretend, and to prove how well Israel could partner with countries of mainly Muslim majorities. The invitation list and the Azeri sponsorship was spurred by Israeli Prime Minister Binyamin Netanyahu’s concurrent state visits to Azerbaijan and Kazakhstan, both Muslim-majority nations. When it was time for recognition, Hoenlein presided over the festivities as though he were addressing a circle of friends, not adversarial diplomats, giving each representative a commemorative menorah. Turkey’s ambassador was as much at ease as anyone even though normal relations have just recently been restored with the Erdogan government. Even the PLO representative was in a smiling mood as he posed for pictures holding his menorah, handed out business cards, and even shook the hand of Ambassador Dermer, this at a time when relations between the PA and Israel are at a recent all-time low. What normally would have been recorded as a diplomatic breakthrough by Hoenlein and the Israeli Ambassador, unfortunately, became mired in protest and boycott by Jewish groups as well as massive misreporting and under-reporting of the event. The major problem inhaling all the room’s oxygen was not that Israel was finding common ground with predominantly Muslim nations as well as other regional players, but that the common ground in question was located in a function room of the Trump International Hotel on Pennsylvania Avenue in Washington, D.C. Hence, everything about the event from the wording on the invitation, “celebrating religious freedom and diversity,” to the guest list, to the attendees, to the refuseniks, all became mired in the miasma of the Donald Trump electoral controversy. Suddenly, it was not important that the PLO, Turkey, and numerous other countries were officially and amicably participating in a Jewish-Israeli celebration of historic national strength. All that was dwarfed to a far back burner by the fact that the Conference of Presidents was visibly appearing at a hotel emblazoned with the moniker Trump. According to sources at both the Azerbaijani embassy and the Conference of Presidents, the selection was made by Azerbaijani Embassy because it was just a few minutes from the White House, and many on the guest list would be shuttling between both celebrations. Moreover, the Trump Hotel was the only nearby facility capable of complying on short notice with the kosher kitchen requirements for some 200 guests. Nonetheless, several other Jewish organizations–members of the Conference—announced that they would be also boycotting. The Central Conference of American Rabbis, the rabbinical association of the reform movement, complained, “Holding this event at Mr. Trump’s hotel is at odds with that idea and with many policies and values of Jewish life and community.” Jewish Women International issued a press release headline, “JWI Will Not Attend Conference of Presidents’ Hanukkah Party at Trump Hotel, and they were joined by the National Council of Jewish Women, Americans for Peace Now, HIAS, Ameinu, and the small historical Jewish labor group known as the Workmen’s Circle. Skipping over the importance of assembling Muslim and regional diplomats to celebrate historic Israeli nationalism and religious pluralism, news of the party was soon dominated with the boycott and ensuing protest. This was especially so in the Jewish media, that is, the printed newspapers and web new outlets serving the Jewish community. Moreover, the precision and balance of the reporting became an issue. One Jewish media outlet claimed the media had been excluded from attendance. In fact, four members of the media were invited including this writer. All four were affiliated with national outlets. None of the four were prohibited from writing about the event or received any guidance. Several Jewish newspapers carried a well-bannered story asserting that Malcolm Hoenlein would be “standing in a largely empty, ornate Trump International Hotel ballroom late Wednesday afternoon during the Conference of Presidents’ now-infamous Hanukkah party.” The story added “Nobody’s going. The reasons are obvious,” said one Washington Jewish insider. “It is highly embarrassing for Malcolm Hoenlein.” The affiliation of the “Jewish insider” was not indicated.” On its face, this report strained credulity. Any large international hotel ballroom is generally configured to seat 500 to 1,500 people. It was known that only 150 to 200 people were invited. Hence, a small function room or party room was needed. In this case, it was the Lincoln Library Room in the Trump hotel. More importantly, the event was sold out and over capacity even before the story ran. This writer received the last available invitation at 11 a.m. December 13, the day before. Several important personalities in the nation’s capital who wished to attend were denied just an hour later for lack of space. Every confirmed guest received a numbered email for identification purposes with a special caveat that if any reservation would not be used, the RSVP was to be relinquished due to a long waiting list. More than one letter and phone call of complaint was filed by eager diplomatic dignitaries as well as Jewish movers and shakers who could not gain access simply because the event was packed. No one was uninvited to make room for high-ranking last-minute reservations. The false story was never corrected, retracted, or updated by those that ran it. However, one Jewish publication substituted a story by a different reporter with the identical headline so links to the original URL went to a completed different replacement story that also contained erroneous and uncorrected information. Among the major organizations reported as boycotting was the Anti-Defamation League, American Jewish Committee and the Jewish Federations of North America. 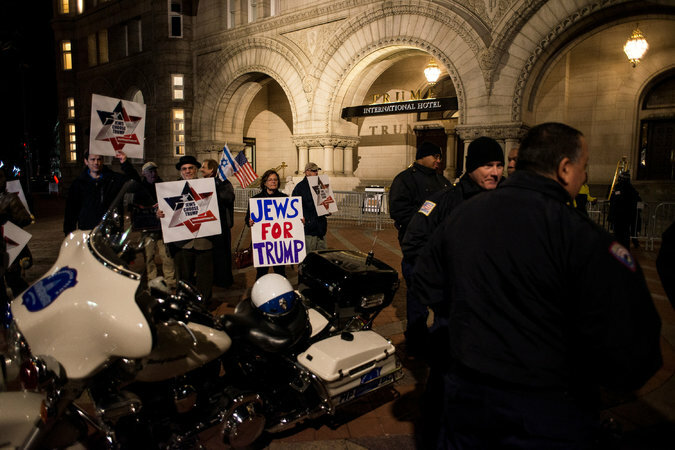 One Israeli newspaper article was even headlined, “ADL, Major Jewish Groups Snub Invite to Trump Hotel Hanukkah Party in DC.” That article stated, “What has not been known, until now, is that several of the Conference’s centrist member groups – core constituents, including the ADL, the American Jewish Committee, Hadassah and Jewish Federations of North America – are also refusing to attend the party.” However, all four named organizations deny it. The fourth cited organization, Jewish Federations of North America, likewise denied the report. A senior executive of JFNA confirmed there had been a scheduling conflict. Some media sources have parenthetically acknowledged the denials, but then ask why organizational stand-ins were not designated to represent them. The Conference of Presidents explains that, as is standard in all such events, the invitations are non-transferrable. All attendees had to bring the printed invitation plus the printed email bearing their name with a special registration number. Hence, an assistant director rather than the director could not show up bearing the invitation because the name would not match the printed invitation for security purposes. Denials notwithstanding, some Jewish agencies contacted seemed to want it both ways. They wanted to deny they boycotted, but not too vociferously, leaving room for some to think they had. This only underscores the dilemma many Jewish organizations face as they dart between the marching elephant legs of fierce support and fiery opposition to the forthcoming Trump administration. Beyond who attended and boycotted, confusion arose over the number of protestors outside the Trump hotel event. One major Jewish media outlet claimed in its lead sentence that “hundreds of protestors” assembled outside the Trump Hotel. Hundreds? That could be 300 to 900. Immediately, this number was scrutinized. The Washington Post reported that more than 150 assembled in protest. The local TV station, WJLA, reported “more than 100.” Two or three other sources reported about 200. A grainy, dark and often-imperceptible video by the chief protest group, known as “If Not Now,” tends to show several dozen. It depends on what moment in the evening that one counted as the assemblage grew and shrank. Opinions will differ on the photographic record. Certainly scores were photographed at the height of the demonstration—but it is hard to discern how many were protestors, how many security, how many pro-Trump activists, and how many passive gawkers. By the time the party disbanded around 6:30 p.m. to 7 p.m., the gaggle at the corner had thinned to just a few people. Meanwhile, the important numbers inside the function room were not recorded in the first wave of reportage. The first Jewish media outlet to write about the diplomatic attendees and the significance of the event was The Algemeiner in an article entitled “Muslim Ambassadors Receive Menorahs as Gifts at Leading Jewish Group’s Hanukkah Party at Trump Hotel in DC.” Later an article was syndicated contrasting the Trump Hotel event and the White House event with some tongue-in-cheek observations and correcting the misinformation about the boycotting organizations. But a seventeen-paragraph article the next day in a leading Jewish newspaper, which focused primarily on the protestors, did not even mention the attendance of numerous ambassadors from predominantly Muslim countries as well as the PLO representative. For its part, a member of the Conference of Presidents decried some of the coverage as “fake news.” The member derided one of the leading boycotting organization executives as “an arsonist,” bent on disrupting an important diplomatic event just because a room was rented at a Trump property. What’s more, the member derided another protesting organization as a small, obscure “half member that no one has heard of for twenty years.” When this writer asked one boycotting executive if she would also boycott events at locations named for Woodrow Wilson who promoted the KKK, the Carnegie Institution because of its involvement with genocidal eugenics, or the Rockefeller Foundation because of its sponsorship of the program that sent Mengele into Auschwitz, she declined to answer, and after another question, she hung up. Leading members of the media are grappling with the concept of fake news and vehemently push back on confusing, deliberately faked news with erroneous reporting. But there is a middle ground between fake news and erroneous reporting. It is slanted news, that is, agenda-driven journalism that cherry-picks information, exaggerates negatives and positives, eschews balance, jumps at the chance to disparage, and leaves in place a false record that is uncorrected, un-retracted, and not updated. Reporting on the Conference’s Hanukkah party may qualify as all three. Edwin Black is the New York Times bestselling author of IBM and the Holocaust, Financing the Flames and The Farhud. He is the recipient of Moral Compass, Justice for All, and Moral Courage awards and can be found at www.edwinblack.com.